Enter one of 4096 possible 6mers into the search field or any nucleotide sequence of less than 7 nucleotides. Use positions 2-7 of the guide/antisense strand of the RNA duplex as the 6mer. 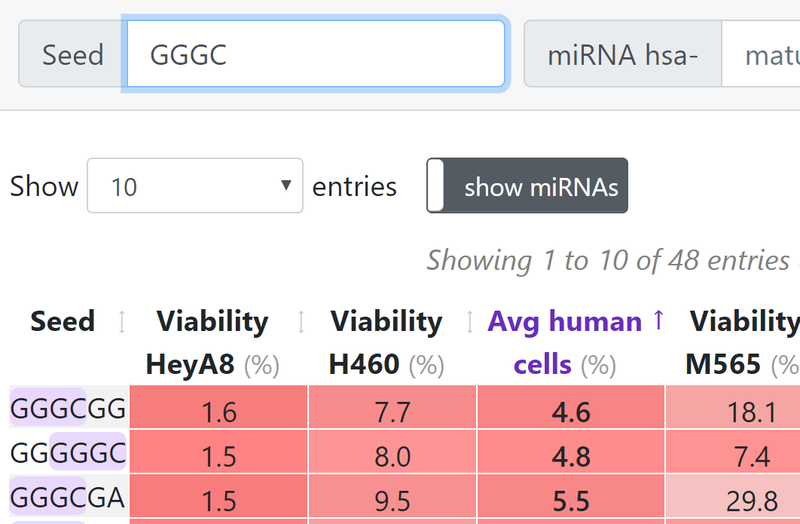 Type in the miRNA search field. It will auto-complete to show matching mature miRNAs. You can also use the miRNA accession number. 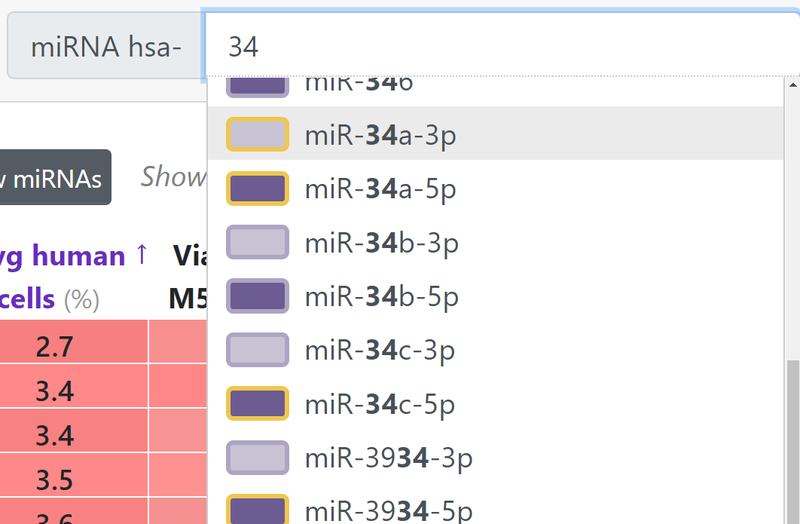 Each miRNA is color-coded. The colors are explained in the Info section below. 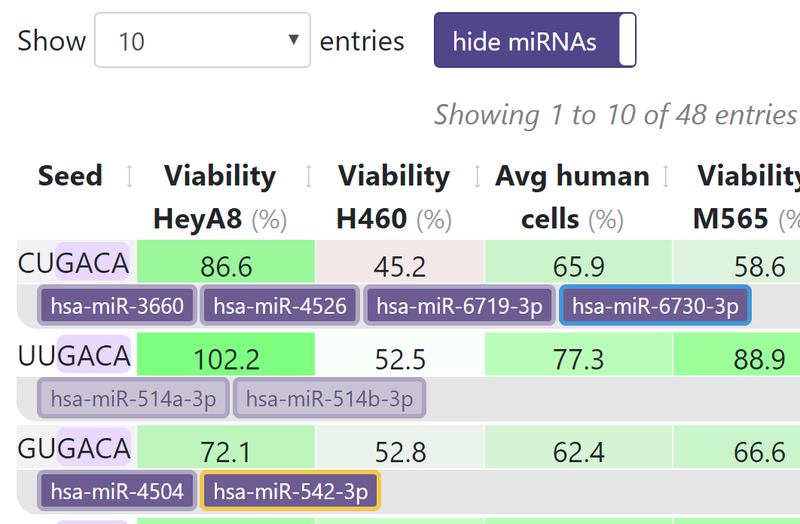 With show miRNAs enabled, you can click on a mature miRNA in the results to be taken to the mirbase.org page corresponding to its accession number. This site allows to determine the activity of any siRNA, shRNA, or miRNA to be toxic through its 6mer seed sequence in human (HeyA8 - ovarian and H460 - lung) and mouse (M565 - liver and 3LL - lung) cancer cell lines.
) will likely be tumor suppressive.
) can be tumor promoting. All other miRNAs are either not processed by Drosha (i.e. miR-320a), miRtrons, or not significantly expressed in HCT116 cells. Gao, Q.Q., Putzbach, W.E., Murmann, A.E., Chen, S., Sarshad, A.A., Peter, J.M., Bartom, E.T., Hafner, M. and Peter, M.E. (2018) 6mer seed toxicity in tumor suppressive microRNAs. Nature Comm, 9:4504. This site was developed by Johannes Peter.